"Below you'll find some cool Mickey Mouse party games!" 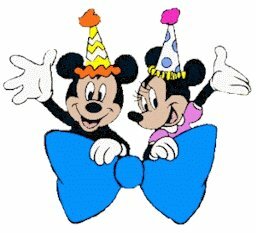 If you have not looked at our Mickey & Minnie Mouse Birthday party ideas have a look at those ideas too! There you will find lots of Mickey & Minnie Mouse Birthday party ideas for decorations, invitations, food ideas and much more. But now scroll down and check out our cool Mickey Mouse party games. Most of the games below are for small children. What Does Mickey Mouse Whisper: Let the kids sit in a circle. Start the game by whispering a silly sentence to the first child, include Mickey mouse in the sentence. For example whisper "Mickey mouse loves green cheese". That child then passes the whisper on to the child sitting next to her in the circle. And then the whisper continues to the next child, until it gets back to the beginning. Then the child has to say the sentence out loud and compare the sentence with the original sentence. Has the sentence changed traumatically? Musical Cushions: Mickey Mouse party game similar to musical chair but played with Disney music. Lay 2 rows of cushions on the floor. When the music starts let the children march around the cushions. When the music stops, they have to sit down on a cushion as quickly as possible. The child who has not a cushion to sit on is out of the game. Remove one cushion for every round someone is out of the game. Pin the nose on Mickey or Minnie Mouse: Mickey Mouse party game similar to Pin the Nose on the Donkey. Before the game draw a large Mickey or Minnie Mouse poster to the wall of the party room. Draw and cut a mouse nose to each guest, write their name on the nose they will use. The kids have to be blindfolded and spin them around three times until they are facing Mickey or Minnie Mouse and let one by one try to pin the nose on Mickey or Minnie Mouse. The player who places the nose closes to the correct spot on the poster is the winner. Mickey & Minnie Mouse Treasure Hunt: Let the kids look for Mickey & Minnie Mouse items. Before the guests arrive hide the treats and toys all around the party room. Before starting to play give each kid their small mini bags to hold the treasure. Give the kids 5-10 min to find the goodies, give them more time if they are younger. Mickey.. Mickey.. Row the Boat Row the Boat: Two children sit opposite each other holding hands, rocking backwards and forwards and singing "Mickey mouse.. Mickey mouse.. row the boat, row the boat.. row, row, row.. row your boat, gently down the stream. Merrily, merrily, merrily, merrily, life is but a dream". This game is good for small children. I hope our Mickey Mouse party games will help you in your planning and I hope your child will enjoy her Mickey or Minnie Mouse Party.